Maxwell Fry and Jane Drew were pioneers of Modern Architecture in Britain and its former colonies from the late 1920s through to the early 1970s. As a barometer of twentieth century architecture, their work traces the major cultural developments of that century from the development of modernism, its spread into the late-colonial arena and finally, to its re-evaluation that resulted in a more expressive, formalist approach in the post-war era. 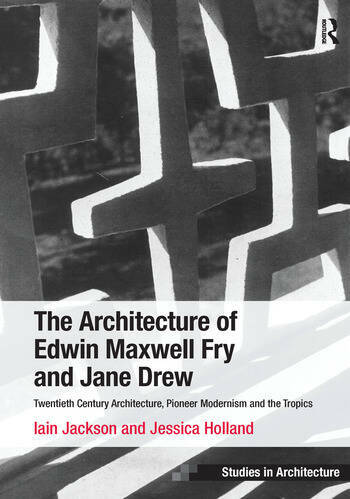 This book thoroughly examines Fry and Drew's highly influential 'Tropical Architecture' in West Africa and India, whilst also discussing their British work, such as their post World War II projects for the Festival of Britain, Harlow New Town, Pilkington Brothers’ Headquarters and Coychurch Crematorium. It highlights the collaborative nature of Fry and Drew's work, including schemes undertaken with Elizabeth Denby, Walter Gropius, Denys Lasdun, Pierre Jeanneret and Le Corbusier. Positioning their architecture, writing and educational endeavours within a wider context, this book illustrates the significant artistic and cultural contributions made by Fry and Drew throughout their lengthy careers. Contents: Introduction; From classical beginnings; Thirties’ development; Jane Drew and the partnership’s origins; West Africa: planning, village housing and new schools for Ghana; The development and reassessment of tropical architecture in West Africa; Chandigarh and the tropics revisited; Humanism and monumentality (a post-war compromise); Conclusions; Chronology; Bibliography; Index. Dr Iain Jackson is a lecturer in the School of Architecture at the University of Liverpool. He is an architect and has worked on a number of construction projects throughout the UK, mainly in the education sector. Dr Jessica Holland is a researcher at the Centre for Architecture and the Visual Arts, University of Liverpool.